Chicken Vesuvio is a dish that’s been around the Chicago area for a long time, but we’d never heard of it, not until our friend Duke told us about it. 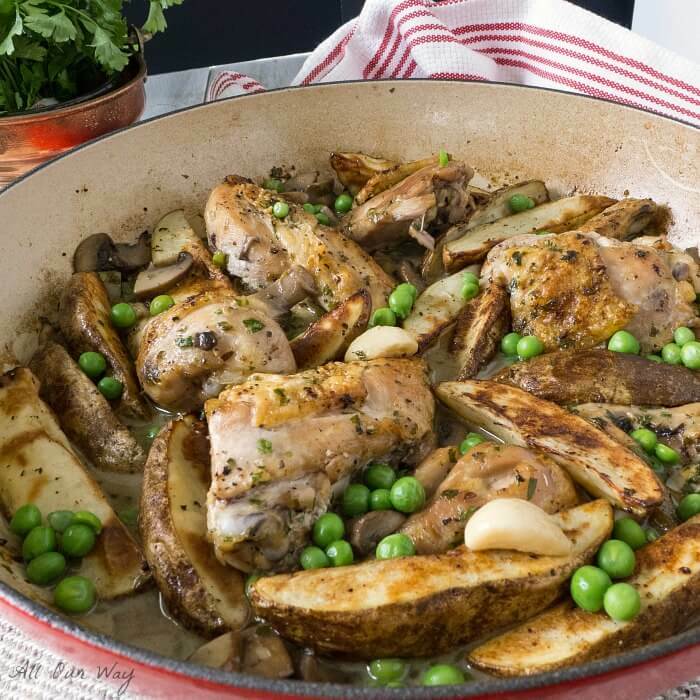 He described his favorite chicken dish as deliciously moist and garlicky with browned potatoes to help soak up the rich juice and fresh young peas tossed in to give the dish sweetness and color. What brought a grin to Duke’s face wasn’t the dish itself but the funny story that went along with it. Duke told us a story of how he and his wife, Jenny, had flown home to visit with his mamma and his Italian relatives. Just as he and Jenny were ready to say their arrivederci, mamma handed Duke a sack. What was in the sack? Now, you’re familiar with Italian mammas or nonnas you know that they won’t let you leave their house without handing you some food to take along “just in case you get hungry”. You could have eaten a ten-course meal but they’re still going to make sure you have something “to tide” you over. The trip could be five minutes or five hours, it doesn’t matter. It’s an unwritten law. Italian mammas and nonnas lose their badge of honor if they let someone leave their house without extra food to sustain them. So it was with Duke’s mamma. It didn’t matter that the flight would provide a meal. Airplane food? Bah!! It wasn’t fit to eat. . . not for her son and wife. Duke didn’t have to open the sack all the way to know what was inside. The aroma of chicken and garlic filled the air. Duke wasn’t shy, he gladly took his sack, thanked his mamma for her thoughtfulness, then gave her a warm hug and big kiss good-bye. 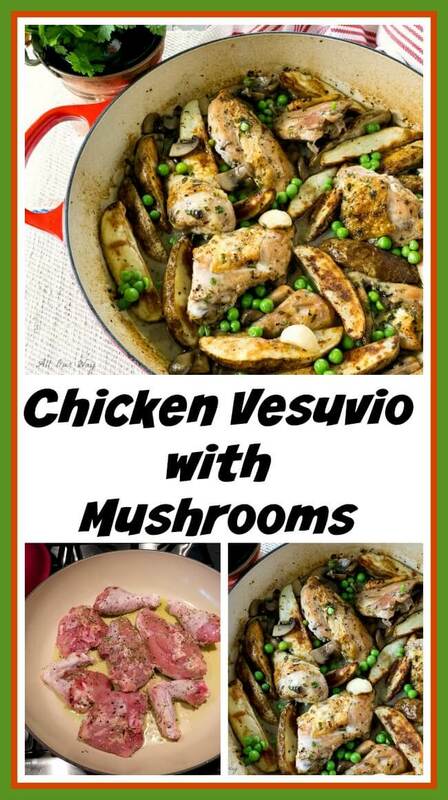 Ever since Duke told us about Chicken Vesuvio, I’ve come across the recipe several times. When I tried to duplicate the flavor, I tried to recall what Duke said his mamma put in her recipe. I settled on following several recipes then adding a touch of our own. One recipe is from a wonderful cook, Marie, at Proud Italian Cook; another recipe is from Saveur ,and finally Cuisine Weeknight Menus Issue 6. We decided to add mushrooms to the recipe because we really like mushrooms, but if you don’t like them, omit them. Most recipes brown the potatoes in the skillet but in the Cuisine version, they suggested baking them so they’d be nice and crispy. We loved that idea so once the potato wedges were baked we added them to the finished chicken. The potatoes were delicious, not mushy or soggy but crisp. These tasty dishes won’t disappoint. They are some of our favorites! 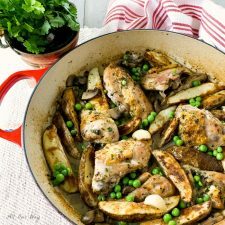 A garlicky and succulent chicken dish roasted with white wine, mushrooms, peas and baked potato wedges. 1 1/2 cup sliced cremini mushrooms 3 oz. Season the chicken with salt, pepper and oregano. Don't be shy with the seasonings. Coat the bottom of a large, heavy skillet or Dutch oven with olive oil and heat over medium heat. Once the oil is hot place the chicken skin side down to sear. Be patient and allow the chicken to brown on one side before turning and browning on the other side. It will take about 4 minutes on each side. Add garlic cloves to the skillet and cook until golden brown. Remove and put with the chicken. Add the sliced mushrooms and sauté until they release their liquid and start to brown. Pour in the white wine to deglaze the pan, making sure all the delicious bits and pieces are scraped up. Add the chicken broth and cook down for several minutes. Add the chicken, garlic and parsley back into the pan. Place the uncovered pan into the preheated oven. 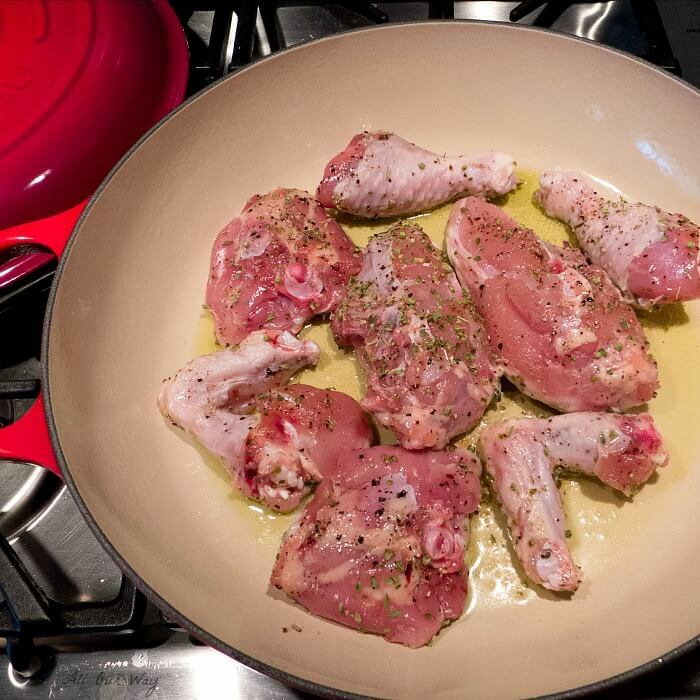 Cook the chicken for about 25 minutes or until the chicken reaches an internal temperature of 165 degrees. Remove the pan, add the butter and stir to form a smooth sauce. Add the peas to the pan. Keep warm. Preheat oven to 450 degrees F. Cut potatoes into wedges and toss with oil, salt, and pepper. Transfer potatoes to a foiled lined baking sheet sprayed with vegetable oil and roast 15 minutes. Flip potatoes and roast 10 minutes more. Serve the chicken, mushroom, peas with the potatoes and pour the delicious sauce over them. Sprinkle the remaining 1 Tablespoon fresh parsley over chicken. I used a convection oven so my time may be different than yours. Be sure to take the internal temperature of the chicken for accuracy. I have a double oven so I was able to make the potatoes and chicken at the same time. You can also make the potatoes first, then decrease the oven temperature for the chicken. After taking the chicken out of the oven to finish, pop the potatoes back in the oven to heat up. I just had Chicken Vesuvio for the first time tonight at a restaurant (Trattoria Oliverii) in Northbrook a suburb of Chicago. It was AMAZING. Mine didn’t have mushrooms or peas but the SAUCE oh my – perfect infusion of wine, garilic, chicken. SO good! Been searching the Internet for a recipe and this looks very close. I can’t wait to get home and make for my wife. Hello, Tim! Let me know how you like the recipe. We loved the dish and the person who introduced us to it said it was like he remembered. My heavens . . . it looks and sounds delicious! I LOVE the thought of the potatoes (or any vegetables for that matter) soaking in all the yummy goodness in the pan. As always, I enjoy reading the stories behind your recipes! I smiled when I read that Italian mammas and nonnas lose their badge of honor if they let someone leave their house without extra food to sustain them. I LOVE that!! I hope that you’re back home and settling in! Hello Suzanne!! Thank you. I miss seeing you! I’m hoping you’ll be giving us one of your special treats real soon! We’ve been running around our yard like crazy people. Mulch had to be put down and now it is finished whew!! Take care, dear friend, sending big hugs!! Funny, I’d never heard of this dish before, but I have to say it sounds like good, old-fashioned honest eating. And I do love the name! Marisa, this looks delicious and I think my kids would also enjoy it. I just started something new this weekend. I’ve decided to post the dinner recipe for the entire week (only Monday-Friday) so my kids can stop asking me “what’s for dinner” as soon as they see me-lol. I’m going to save this recipe and spring it on them. I’ll let you know how it goes over. Grazie Chiara!! Sei molto gentile. Una buona serata!! I’d happily take that on a plane or anywhere else. It does doesn’t it. I know that our friend’s family came from southern Italy and even though it was made popular in Chicago I believe there are many variations. I think I will make this for our next family dinner. I think your family will really enjoy it, Theresa! Have a great day. My family would really like this recipe. It is one pot which I like too. It is fast and easy maria! My mouth is absolutely watering looking at these photos! What a gorgeous sounding recipe! Thank you Elizabeth! It is a recipe that you’ll want to make on a regular basis — at least we will. 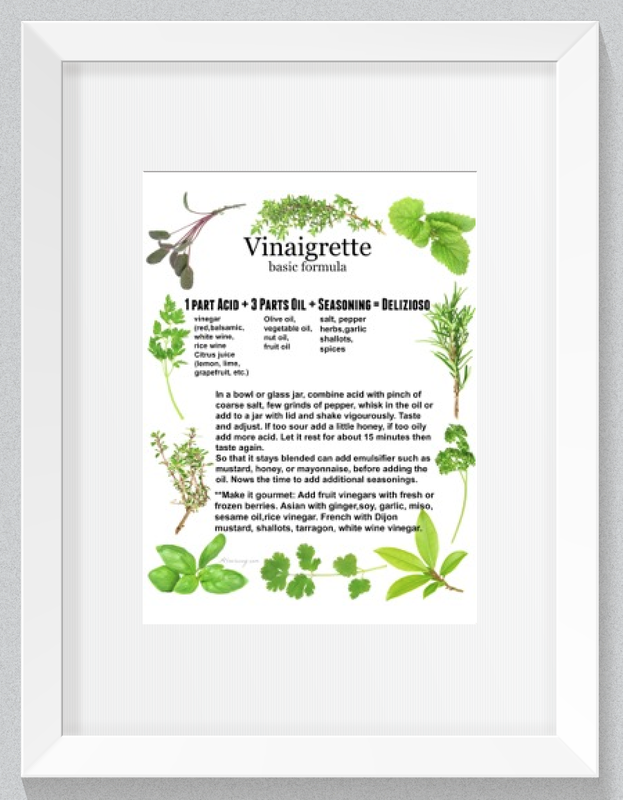 Printed this recipe to make later this week. My mother and grandmother made this at times, but believe it or not, I never found a recipe! Haven’t had it in years. Thanks for the post—not only did it bring back good memories, but it gave me a dinner recipe for this week! I can’t believe it’s taken me this long to make it. Duke told us about the recipe years and years ago. Hope you like it. So homey, rustic and comforting! Everything I love in a dish! You nailed it, my friend! This is one I need to make, soon!! Thank you! I love the way this dish looks! It would make a wholesome lunch or dinner.. I love cooking chicken in white wine! It always turns out wonderful! YUM! Hi Diana! Yes wine does give it that special touch and you really don’t taste it at all. I want a Nonna to make that for me! Looks yummy – and it’s a great story! I have never heard of this dish either but it looks and sounds delicious! Definitely a must-try. And I love your story about Italian moms – made me think about Joey from Friends for some reason lol. Ciao Jolina! Mammas and donnas are a breed unto themselves and not just Italian! I love to try a new homemade chicken recipe! This Vesuvio chicken looks so good. Saved to make it later this week. Thanks for sharing it! You’re welcome Oana! Let me know how you like it. 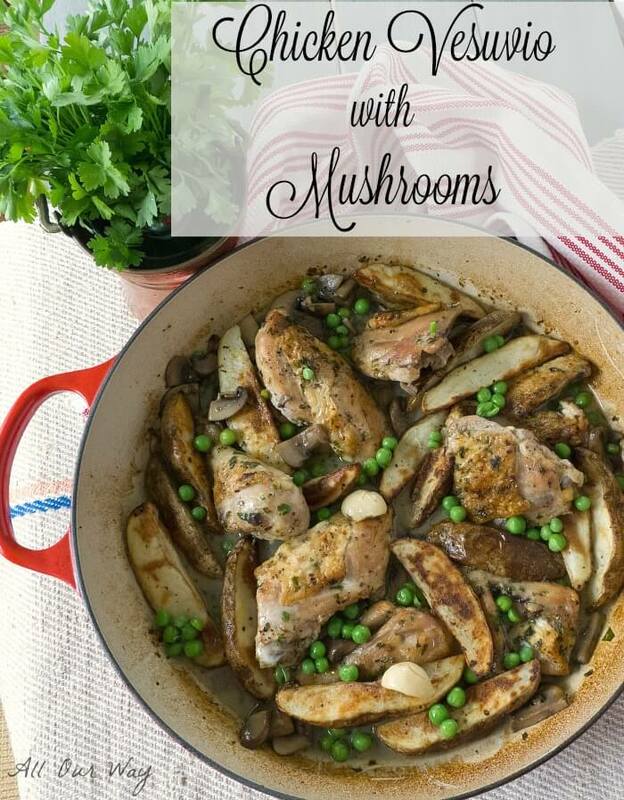 Love chicken and potatoes together and you can’t go wrong with mushrooms. Your recipe is similar to mine, except we put hot pepper in also. You are right there are numerous recipes for this dish and some even include Italian sausage, but I am not sure you would call it Vesuvio. You have a great idea about cooking the potatoes separately and then adding them to the dish. Great meal. Hi Jovina! We really liked the flavors. Some recipes include lemon but we already have a lemon and garlic chicken so we left it as is. It was great! Now your recipe with hot pepper sounds great!